Pine wood letters are perfect for any indoor sign project. 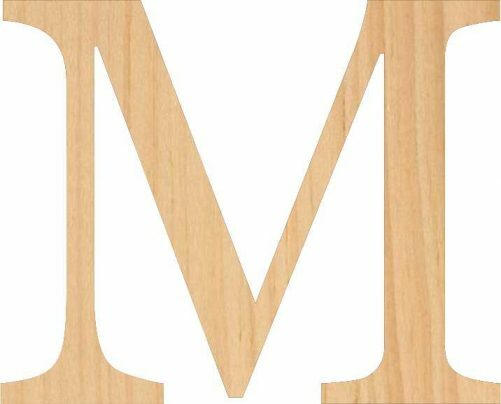 Adding these solid pine wooden letters to any design is a great way to make them stand out. Stained or painted, they are a one of a kind treasure. Pine letters are easy to work with, but can be delicate. Approximately ¾ inch thick Eastern White Pine sanded and ready to paint or stain. We have over 100 fonts to choose from for your unique letters. These wooden letters are large and bold. Sizes are available from 4 inch to 10 inches tall. Your letter(s) will be sized by the tallest letter you are ordering. If you order the word “Books”, the ‘B’ will be the height you order and the rest of the letters will be sized proportionately. Add these letters to a picture frame, a wreath, a box crate or a toy box to give it your unique twist. You could even create your own monogram style with the single letters. The possibilities are endless when it comes to designing these gorgeous solid letters. So natural and your projects will be the envy of all your friends. We hope you love these letters as much as we do!